Lucas Dumbrell has confirmed that his eponymous team will only field one car in New Zealand next weekend after Scott Pye’s heavy accident at Symmons Plains today. Pye was lucky to escape his wrecked Holden with only minor injuries after being pitched into the Turn 2 wall following a complete brake failure. 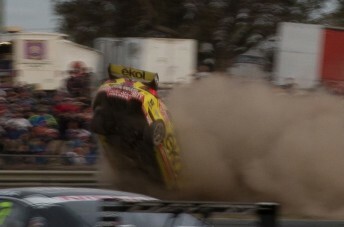 Dumbrell told Speedcafe.com that his team won’t know if the damaged Triple Eight-built car is fixable at all until it is back on a chassis jig in Queensland. “The biggest thing at the moment that we’re focussed on is getting it back on the jig because it’s structurally pretty messed up,” he said. “Until we get it on the jig we’re not going to know the extent of the damage. “A big hit like that puts such a shockwave of force through the chassis that I wouldn’t be surprised if there’s stuff that’s damaged at the back of it. “Until we have it back to an absolute shell we’re not going to know the extent of the damage. Dumbrell had a brief discussion with Triple Eight principal Roland Dane about the possibility of accessing a spare car, but says that such a swap will not be possible. “Triple Eight’s first car (which tested twice last year) isn’t suitable for racing, it was a bit of a hybrid because a lot of the rules weren’t confirmed at that point,” he explained. “I had a quick conversation with Roland about their spare car but that’s not completed yet. “I don’t think anyone has a spare chassis up and running yet, and it’s not like we can go and get a VE from the Development Series or anything like that because of the Car of the Future. The team will almost certainly go unpenalised for missing the New Zealand meeting on the grounds of force majeure.